Date(s): 11/13/2015 - 11/15/2015. Album by Mike Rohan. Photos by Mike Rohan. 1 - 21 of 104 Total. 1451 Visits. National Commander's Aide Dewey Moss, Candidate Denise Rohan and National Commander Dale Barnett in front of the Idaho State Capitol prior to the Awareness Walk. Commander Dale Barnett (far right) being interviewed by local Boise, ID news station while Legion Family members watch on. Awareness Walk Banner on steps of Idaho state capitol. 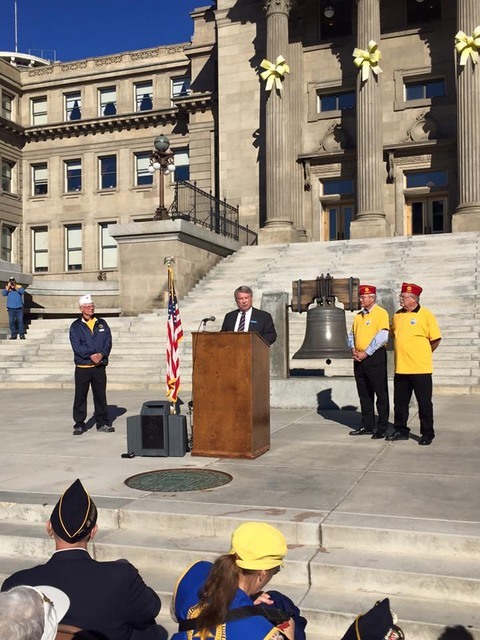 Idaho Secretary of State Lawerence Denney presents a Proclamation from Idaho Governor Otter declaring an American Legion Walk for Veteran's Day to National Commander Dale Barnett on steps of the state capitol. Idaho Commander Derrick and National Commander Barnett lead the delegation on the Awareness Walk for Veterans.